Gym finally stops its sexist pricing policies – the first of many? 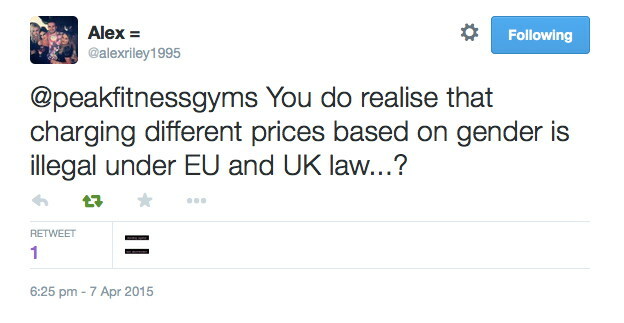 Earlier this year, HEqual was alerted to discriminatory pricing at a gym in Hertfordshire. Peak Physique Gym in Hitchin was charging male customers £30 per month compared to £15 for females, despite actually offering superior facilities to women then men! Not only does the gym boast of having a “fully equipt “women only”” room, its website also notes “women’s changing rooms have built in hairdryers & hair straighteners, as well as dedicated make up areas, private cubicled showers & changing rooms”. At HEqual we were obviously concerned about his blatant breach of the law by the gym in question, afterall it’s clearly unfair to charge men double than women and even offer them an inferior product to boot! Therefore we contacted the gym in question and informed them of their breaches of UK equality law. Peak Physique decided to throw their toys out of the pram from the minute we first contacted them. We were largely busy with other matter at the time so only had chance to send one email to the company, yet we received mutiiple replies stating “Go for it. Shut us down.” and “Please do whatever you like about this, it’s not going to change”. Other concerned equality advocates received equally aggressive and angry responses. After receiving just a handful of tweets on the matter the company decided to completely delete its Twitter account, it deleted all negative Facebook reviews and proceeded to make various false claims about what was going on. Peak Physique eventually posted an article on their blog titled “It’s different for girls” defending/denying their sexism, stating the pricing structure was legal and that it would continue. They also promised to update their website to explain the pricing policy, though no such update was forthcoming. Instead, the company quietly wiped all evidence of their sexist pricing structure from the website and suggested customers call for such information. Recently, we were pleased to recently hear from a HEqual supporter who had been in contact with both the Equality Advisory Support Service and Hertfordshire County Council about this matter. They were able to confirm that following considerable communication between themselves, the council and the gym, the company finally ceased in operating its sexist pricing structure! We’re not aware of the company issuing any formal statement on the matter or apologising for its conduct, though obviously we’re pleased with the outcome and would like to congratulate everyone who worked so hard to make this happen. Unfortunately, businesses such as Peak Physique are from from unique and plenty of others routinely discriminate against men. In Canada it recently emerged that there are now bike shops that actually ban both male staff and male customers on Sundays, and just yesterday another case has come to light of a UK Gym charging men considerably more than women.